Two years after Emily’s father dies in a car accident, she moves with her mother and brother Navin to a house that has been in the family for years. While cleaning the place up, Emily finds an Amulet among her great-grandfather Silas’ things. The first night in the house, their mother is taken by a tentacled creature and Emily and Navin set out to rescue her. Emily’s father is killed in a car accident that she and her mother survive. 2 years later, Emily, her mom, and brother Navin move to a house that has been in the family for years. It belonged to Emily and Navin’s great-grandfather Silas Charnon, an eccentric puzzlemaker who disappeared years ago after his wife died. Emily finds books on stone power and an Amulet among Silas’ things. 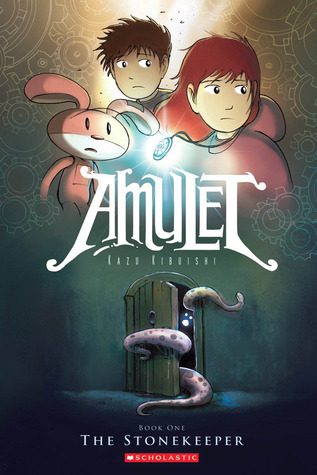 The Amulet lights up, speaks to her and tells her her family is in danger. After hearing noises in the basement, their mom is taken by a tentacled creature and is trapped inside it. She is taken through a door to what seems to be another world. Emily and Navin go after her. Navin is also taken, but gets away. The creature gets hold of Emily, but she uses the Amulet to make it let her go. The Amulet tells Emily to find Silas in order to save their mother. They use the Amulet to guide them, but Navin is wary of its power. Silas’ assistant Miskit stuns the elf and helps Emily and Navin to Charnon House where they meet Silas who is on his deathbed. Silas explains that if she accepts, Emily is to inherit the Amulet from him which contains a stone that gives the power to rule Alledia (an alternate version of Earth). Silas tells her to listen to the stone in order to save her mother. Before Silas dies, he asks Miskit to teach and guide Emily. Emily makes the choice to accept the stone’s power, taking Silas’ place as Stonekeeper. Navin pilots the Albatross (a plane) through the Gauntlet (a dangerous tunnel) to take Emily and Miskit to find their mother. The Guantlet is filled with rakers (deadly creatures with tentatacles and teeth), but they make it through. They are close to rescuing their mom, but have to let her go; Emily goes after her on her own. Emily meets up with the elf following them; he tells Emily he wants her help to destroy his father, the Elf King. The elf splits open the creature Emily’s mom is trapped inside and lets her go. The Amulet tells Emily to destroy the elf, but she lets him go. Emily brings her mom back to Charnon House, but she is poisoned and needs an antidote they think they will find in the city of Kanalis, 300 miles away. The Albatross is destroyed, but it turns out Charnon House itself is a vehicle they can use to get there. Everything is secured and Charnon House is on the move. It looks sort of like a robot and walks on two legs. It climbs out of the ravine it is in and Emily, Navin, Miskit, and the other robots in the house (including Cogsley, Bottle, & Morrie) are off to find an antidote.